Four Common Inventory Issues - Which Do You Want To Fix? Data Profits > Blog > Resources > Blog > Four Common Inventory Issues – Which Do You Want To Fix? This is an excerpt from: “Four Familiar Inventory Troubles – Which Do You Want to Overcome?” in the September 2013 edition of Retail Value Chain Federation’s monthly newsletter. CLICK HERE to see the complete article. This is part 4 of a 5 part series on Demand Forecasting and Inventory Replenishment. 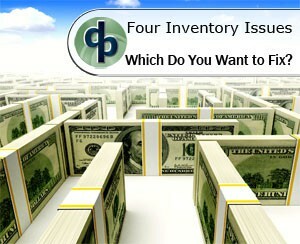 Inventory optimization has been made to sound like the “end all” answer to these four profitability issues. Is it a state of nirvana for retailers that, if reached, magically removes all inventory issues? What is inventory optimization and is it truly the “final answer” to your inventory planning and operation execution issues? Is inventory optimization a goal, a plan, a piece of software, or an industry term? We blame poor inventory planning as the cause for many of our business problems. Is inventory optimization then the “Holy Grail” of inventory deliverance? In a Utopian inventory world, an optimized inventory delivers the right quantity of products at the right locations; fulfilling all customer demand and exceeding revenue goals – with no inventory left on the shelf and deferred billing from suppliers. Well, unfortunately for the dreamers in the audience, inventory optimization in the real world is an approach, a journey; a business philosophy to improved operating results. It requires data, educated and trained people, and some fairly sophisticated software and analytics to deliver. Inventory optimization can provide significant improvements, if properly executed. Start your journey! 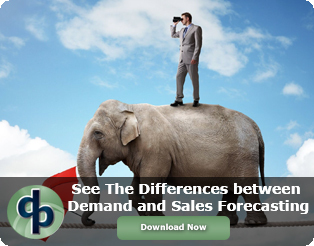 Do You Know the Difference between Sales & Demand Forecasting? Which forecasting method does your system use? How can you use that knowledge to drive better results? Step 2: Lead Time Forecasting is needed to translate past receipts and expectations into new order dates, impacted by service goals and current and expected lead times. This can be tricky as lead time variances change and demand forecast have seasonal and market trends being applied or removed as all the pieces start to move. While many systems report on supplier lead time variance and fill rate, these measurements are not translated into ‘buy on this date’ decisions. Remember, the lead time unit of measure is time; to understand units to support sales, the demand forecast and lead time variability must be integrated with a system to create the purchase order on the right date. Most systems use the plan to define the purchase date and then create replenishment orders. Often that model reacts too late to sustain the flow of inventory to support service goals. The results of these actions are out of stocks, low service, and lost sales. There are four things to review when solving these types of inventory issues. Next week we will list the other two and include additional ideas for your review. Inventory optimization can deliver strong results for your business – we have seen this with many customers. Retailers that have made progress towards successful inventory optimization have quiet Monday mornings each work week. Planning groups have only three or four reports on their desks and their phones are not ringing off the hook. They work proactively and less reactively managing their inventory. Their quiet confidence and increased productivity tells us that they have made significant progress in their journey of learning how to manage an optimized inventory. An Inventory Optimization solution can rapidly impact the four inventory issues of retail – out of stocks, overstocks, bumpy cash flow, and lost sales. These solutions offer accurate demand forecasting and inventory replenishment systems, improved collaboration and deliver user friendly analytics; they provide improved customer service, increased sales, along with lower inventory and logistics costs. These systems install rapidly and deliver high functionality at a fraction of the costs of legacy systems. Start asking a new set of questions and impact your bottom line.